The Baytown Food and Drink Festival will be held at the Victoria Hotel in Robin Hood’s Bay between Friday 7th – Sunday 9th Dec December. It will run as part of the village’s annual Victorian Weekend. Hosted by the Victoria Hotel, in conjunction with local company Baytown Beers, the festival will showcase local ales and the best of the Yorkshire Coast’s local foods . All Baytown’s beers will be available in cask. Book direct and get all 7 Baytown beers free on arrival. These can be arranged at any time, 7 days a week, to suit yourselves. See below for more information. The second Baytown Beer Festival at the Victoria Hotel in Robin Hood’s Bay is to be held between Friday 2 December and Sunday 4 December 2016. It will run as part of the village’s annual Victorian Weekend. Hosted by the Victoria Hotel, in conjunction with local company Baytown Beers, the festival will showcase local ales. Baytown’s beers will be available in cask together with a range of ales from in and around the North York Moors National Park. At noon on Saturday 3 Dec from the dock, Paul Johnston of Baytown Beers will be leading a one hour smugglers walk around Robin Hood’s Bay with proceeds going towards local good causes. The Victoria Hotel provides the perfect venue for a winter festival. It was purpose built in 1897 and offers superb views over Robin Hood’s Bay from its cliff top location. Facilities include a large bar with real fire, sea view restaurant and tea room. Baytown Bitter at 4%abv is named after the 18th century locals’ name for Robin Hoods Bay. Smuggler’s Haul is a 6% strong bitter with Squire’s Connivance a 5% Porter. Press Gang’s Arrival is a 3.8% pale ale, Revenue’s Revenge is a 4.2% premium lager and feminine wiles are celebrated with Petticoat’s Deceit a 4% premium cider. Whitby Heritage is a 4.4% ruby ale which celebrates Whitby characters captured on camera by Frank Sutcliffe in the 19th century. The Robin Hood’s Bay Victorian Weekend is now in its 23rd year. It takes place between Friday 2 and Sunday 4 December. It brings dozen’s of visitors in period costume to the cobbled streets of old Baytown for three day’s of traditional festive fun. Highlights this year include ‘balls down the bank’ and King’s Beck duck race. There will also be an open house scheme which allows visitors a rare glimpse inside many of Bay’s 300 year old cottages. Regular favourites include carol singing round the Christmas tree in Bay dock and performances by Dr Busker. The streets of old Robin Hood’s Bay will be decked in traditional bunting, lighting and Christmas decorations, with the village’s unique seasonal atmosphere being created by many visitors dressed in period costume. Beverley Rutherford at the Victoria Hotel can be contacted on 01947 880205 and Paul Johnston of Baytown is on 01947 880513. Baytown Beer Festival is supported by the North York Moors National Park Authority through its Local Distinctiveness and Tourism Grant, which funds projects that make it easier for visitors to enjoy the area’s local distinctiveness. October half term brings about two chances to discover the hidden smuggling secrets of Robin Hood’s Bay. On Tuesday 25 October and Thursday 27 October at 5pm, Paul Johnston of Baytown Beers will be leading ‘A Taste of Smuggling’ guided walk followed by a beer tasting. Places are limited and pre booking is essential at £10 per person (which includes a free bottle of beer) through Baytown on 01947 880513. The tour will finish in the village with a beer tasting. The full range of Baytown’s smuggler’s beers will be available and Paul will outline the background to the beers and their history. Guests will get to take home a free bottle of Baytown beer. Besides Baytown Bitter being on tap in the Victoria Hotel’s bar area, Baytown’s bottled beers celebrate the village’s smuggling heritage. All places cost £10 per person and include walking tour, beer tasting and a free bottle of beer. 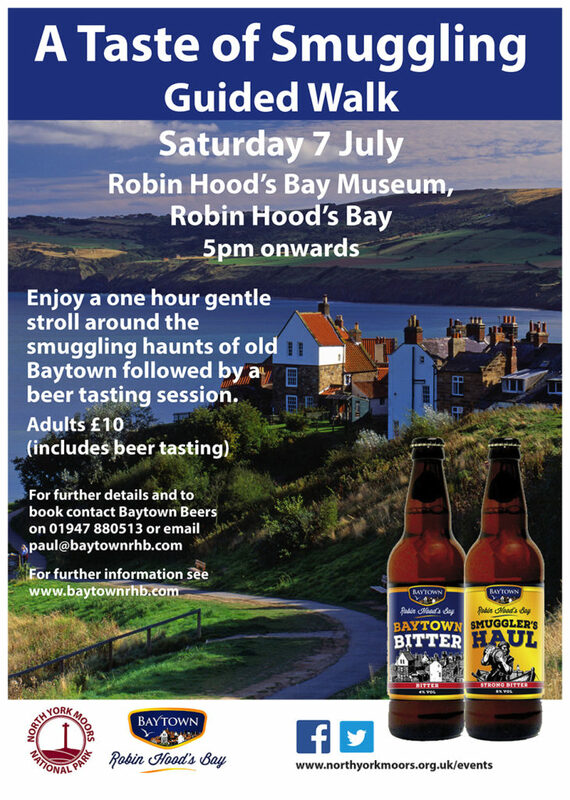 A ‘TASTE OF SMUGGLING’ GUIDED WALK ROUND ROBIN HOOD’S BAY WITH BEER TASTING. 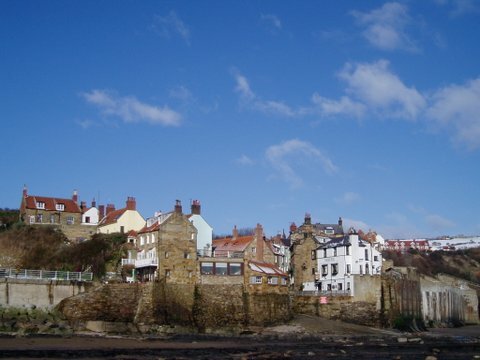 Discover the hidden smuggling secrets of Robin Hood’s Bay this August Bank Holiday. On Saturday 27 August at 5pm, Paul Johnston of Baytown Beers will be leading ‘A Taste of Smuggling’ guided walk followed by a beer tasting. Places are limited and pre booking is essential at £7.50 through Baytown on 01947 880513. Paul recently led the same walk as part of the North York Moors National Park Walkfest 2016. The walk sold out meaning many people were unable to attend. This Bank Holiday walk gives these people and others the opportunity to not miss out. All places cost £7.50 and include walking tour and beer tasting. Baytown, the Robin Hood’s Bay producer of smugglers’ beer, has launched a new range of premium spirits. The range comprises gin, vodka, whisky and port in 700ml and 500ml smugglers’ style heritage bottles. Each drink commemorates the key characters of 18th century smuggling around Robin Hood’s Bay and Whitby. Baytown’s new spirits range is already available at Station Road Stores and the Victoria Hotel in Robin Hood’s Bay, Barnards of Fylingthorpe, Whitby Tourist Information Centre, Village Stores and Gifts in Goathland and Grosmont Coop. Baytown’s new spirits range is supported by the North York Moors National Park Authority through its Local Distinctiveness and Tourism Grant, which funds projects that make it easier for visitors to enjoy the area’s local distinctiveness. The Moors Centre at Danby and Sutton Bank Visitors Centre also stock the Baytown spirits range. New stockists are welcome and trade details can be obtained from Paul Johnston of Baytown on 01947 880513. 700ml bottles: Storm Gin & Ghost Vodka £18.25, Farsyde Port £15.25, and Dragoon Whisky £19.25. 500ml bottles: Storm Gin & Ghost Vodka £15.25, Farsyde Port £13.25 and Dragoon Whisky £16.25. Baytown, the Robin Hood’s Bay producer of ‘Smuggler’s Beer’, is celebrating after being selected to supply its bottled beers to around 40 Co-operative Food stores across Yorkshire. The Co-operative is launching a local supplier initiative which will see the community retailer stock 130 new products from 50 different manufacturers across the county. Baytown has been selected to supply stores with its Press Gang’s Arrival pale ale, Baytown Bitter and Whitby Heritage ruby ale. Kate Jones, Head of Local Sourcing, at the Co-operative,adds: “Our customers have told us they want to buy local products at their Co-op store and so we have responded by teaming up with more than 50 new Yorkshire suppliers. Products made in the vicinity of our stores are prized by people who want to support locally produced regional food which often helps to define a specific area such as Yorkshire.